This isn’t Tuscany, although it looks a lot like it. 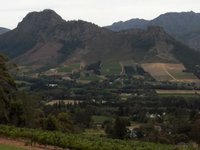 This is the Cape Winelands where we have been for the past couple days. The wines here are good, some are very good. It’s hot here, hotter than the wine growing regions of France and Northern Italy. It’s closer to the climate of Australia and Southern Italy. 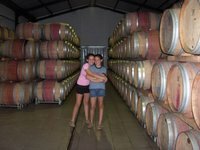 Thus the wines are strong and have more alcholol content. 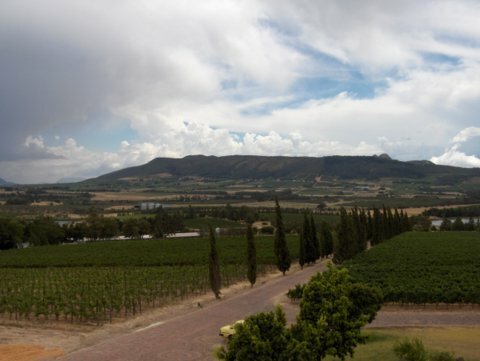 But the tradition of winemaking comes from the French Hugenots and so the grapes tend to be of the french variety, Cabernet, Merlot, Syrah, Chardonnay, and Sauvignon Blanc. 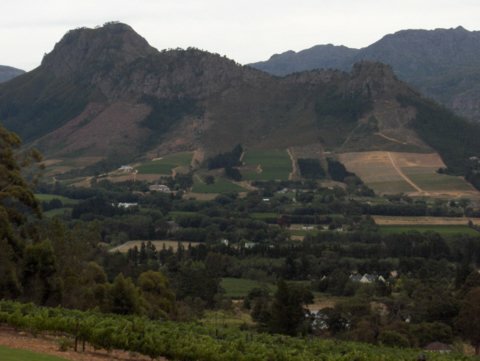 They do have their own unique varietal here called Pinotage which was created by mixing Pinot Noir and Cinsaut (Hermitage). I’ve tried Pinotage three times since I’ve been down here and I have to say I haven’t warmed up to it. It is fruity up front but kind of smoky on the finish and I don’t love it. We visited three wineries yesterday and they were all great. We really liked the 2003 Chardonnay from a winery called Glen Carlou. 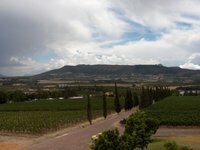 This picture is the view from their tasting balcony. Apparently Glen Carlou sold in the US so we’ll try to find some when we get back. 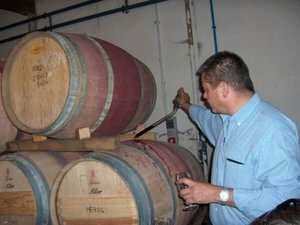 Here is a picture of Mark Lindhorst giving us a taste of the 2004 Shiraz out of the barrel. It was pretty good already. We’ll have to get some of that in a couple years! You can’t get Lindhorst in the US right now, but if you like Shiraz, email me and I’ll give you Mark’s email address and you can get him to ship you some.